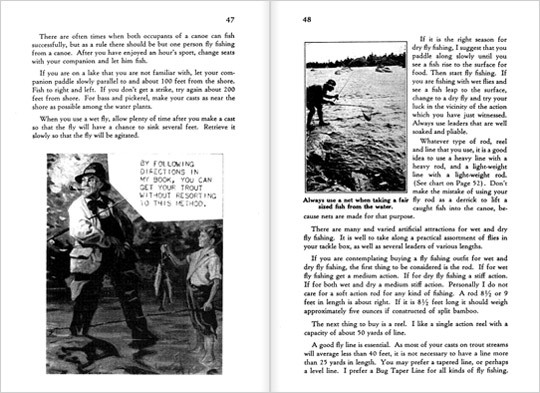 First published in 1942 by Leon L. Bean, Hunting, Fishing and Camping is a classic outdoors manual full of howto’s and practical advice. Topics include how to hunt for different types of wildlife, safety, fly-fishing, and cooking out in the field. While it’s fairly old and not carefully edited, most of the information is still relevant and helpful. Shoes: One pair 12″ Leather Top Rubbers. I also take along a pair of 6 1/2″ Moccasins to wear on dry days on the ridges before snow comes. 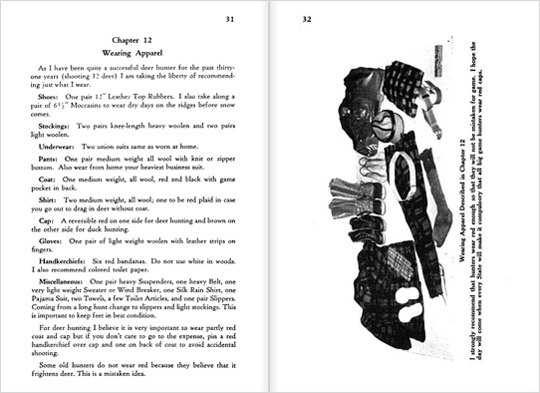 Stockings: Two pairs knee-length heavy woolen and two pairs light woolen. Underwear: Two union suits same as worn at home. Coat: One medium weight, all wool, red and black with game pocket in back. Shirt: Two medium weight, all wool; one to be red plaid in case you go out to drag in deer without coat. Cap: A reversible red on one side for deer hunting and brown on the other side for duck hunting. Gloves: One pair of light weight woolen with leather strips on fingers. Handkerchiefs: Six red bandanas. Do not use white in woods. I also recommend colored toilet paper. Miscellaneous: One pair heavy suspenders, one heavy belt, one very light weight sweater or wind breaker, one silk rain shirt, one pajama suit, two towels, a few toilet articles, and one pair slippers. Coming from a long hunt change to slippers and light stockings. This is important to keep feet in best condition. I believe the “leather top rubbers” would later become the Bean Boot, but I’m not sure what he meant by “heaviest business suit”. Manhattanites in plaid flannel shirts and crepe-soled leather boots are hiking down Fifth Avenue. Students in goose-down vests and baggy sweatpants are trekking through Harvard Square. Dudes in lumber jackets are hanging out in Beverly Hills. Few of these folks have a clue how to swing a fly rod or an ax. But they do know that outdoor gear designed for the backwoods has come in from the cold for wear everywhere. That was written in 1976, but reads like it could have been from yesterday. Here Comes the Preppie Look, written in 1980. The quote from the Cable Car Clothiers manager is great. A Ralph Lauren piece from 1986 – Selling a Dream of Elegance and the Good Life. He was on the cover of that issue. Fashion Designer Ralph Lauren grew up a long way from all the things he really admired: hand-tailored clothes, manor houses, sports cars, fine horses and manicured lawns. But call it a yearning process: as an outsider to that world, Bronx-born Lauren dreamed up his own brand of gentility and style. Now he has managed to create an image and a company that have nearly cornered the market for supplying today’s would-be Gatsbys. Shunning hipness and flamboyance, Lauren cultivates the up-and-coming customer’s appreciation for things and dreams that last. An LL Bean chamois cloth shirt in the Signature line catalog. 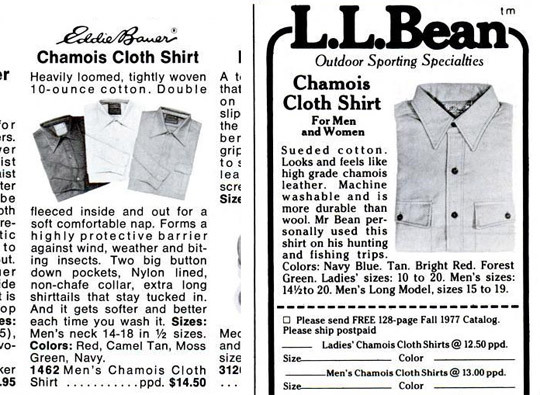 Their copy says that it was first introduced in 1933, but I’ve seen references that state that LL Bean first introduced chamois cloth shirts around 1927-28 – perhaps they’re referring to a particular version of the shirt? The design has supposedly not changed much over the years. Update: Here’s an explanation on the difference in years (click on the chamois cloth shirt image). In the coming decades L.L.Bean would introduce dozens of chamois shirts, varying the styling and colors slightly to keep up with changing times. This model harks back to the original. So, same shirt, but with a different name. 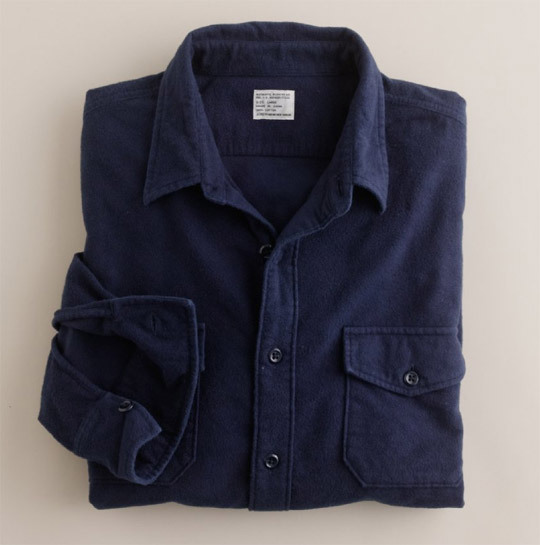 J.Crew’s new version in their utility shirt cut, it’s much better fitting if you’re not looking for an overshirt. Old magazine ads for chamois cloth shirts – just about all outdoor clothing companies made them. More info on Sartorially Inclined. The navy suede versions are going to be a hit. LL Bean is set to reintroduce its older Norwegian fisherman’s sweater within a few weeks, and I’m sure that the Americana crowd in NYC will be sporting them not long after. If you purchase one, please only do it because you like the sweater and not because it’s some supposed Ivy League icon (it wasn’t even popular until the Preppy Handbook was published in 1980 – you guys realize that it was written as a joke and not an official guide on how to dress, right?). And yes, wearing one will make you look as goofy as the people you’ve seen wearing them in the old pictures online. 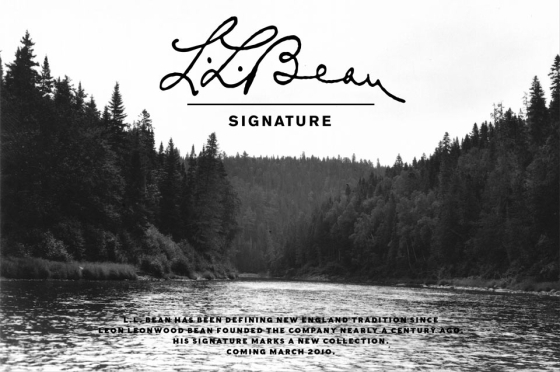 Update: I’ve been told that LL Bean is now selling the sweater by phone (800-441-5713), cost is $129. If you don’t want to wait for LL Bean’s sweater, Woolrich has its own version in the John Rich and Bros. collection this season which you can buy now at Barneys. 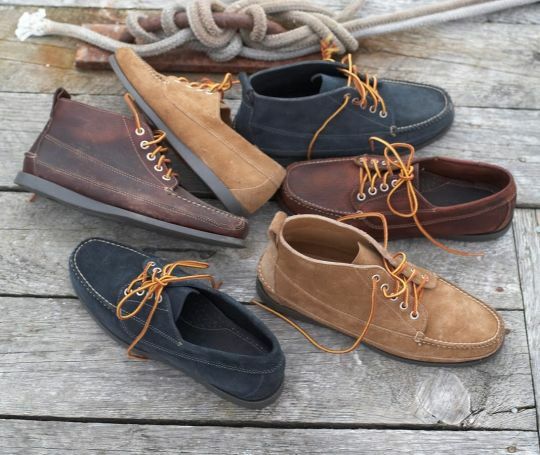 Chris Vickers, a vice president in charge of L. L. Bean Signature, said the prices have not been determined but that you can expect a woven shirt to cost $50 to $70 and a sport jacket about $200. The biggest difference from the classic sportswear will be a fit that is closer to the body. © 2019 Mister Crew. All rights reserved.